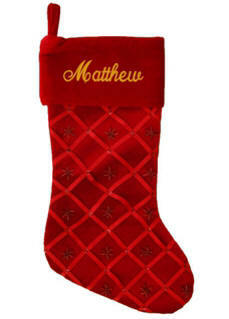 Wide variety of personalized Christmas stockings to fit your budget and taste. 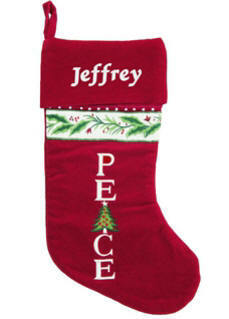 Hang these Christmas stockings personalized with family members name on your mantel this year. We embroider in your choice of lettering style and thread color. Orders ship in 1-2 days. 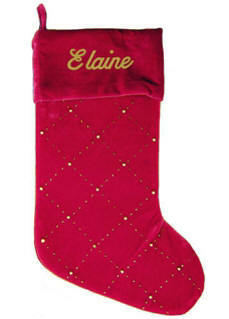 Simple red velvet Christmas stocking with gold bead decoration. We personalize on the fold down cuff. 18 in. Elegant red velvet stocking is decorated with crossed red ribbons, sequins and beads. Monogram the cuff for a beautiful personalized Christmas stocking. 18.5 in. Very elegant gold velvet stocking is decorated with crossed red ribbons, sequins and beads. 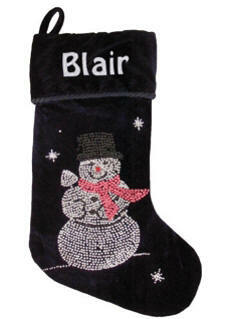 We will embroider the cuff for a beautiful personalized Christmas stocking. 18.5 in. 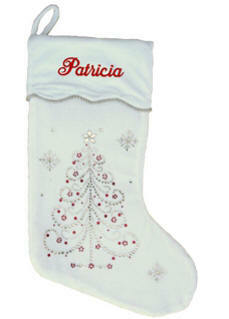 Red velvet Christmas stocking with PEACE embroidered. We personalize with a name embroidered on the cuff. 19 in. long. 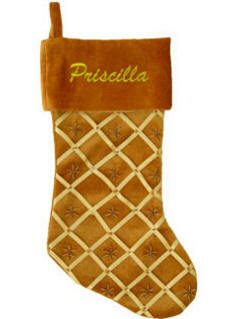 Olive velvet Christmas stocking with JOY embroidered. We personalize with a name embroidered on the cuff. 19 in. long. 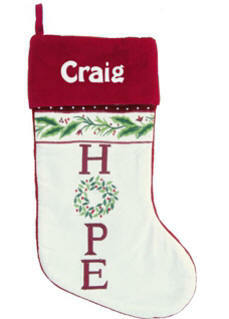 Red velvet Christmas stocking with HOPE embroidered. We personalize with a name embroidere on the cuff. 19 in. long. 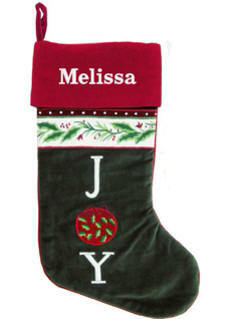 Unusual and beautiful velvet personalized Christmas stocking. Jeweled accents in silver and red form a tree. Personalize with an embroidered name. 20 in. 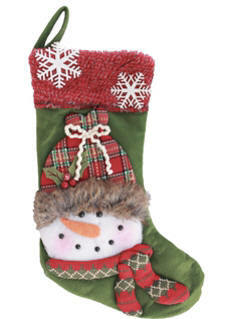 Well detailed appliqued Christmas stocking that lights up. Snowman applique features a plaid hat with fur trim, orange nose, and black coal eyes and mouth. 20 in. red felt. 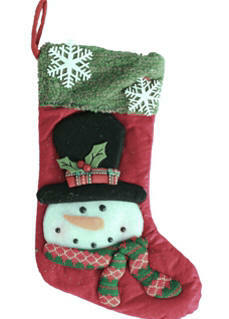 Well detailed appliqued Christmas stocking that lights up. Snowman applique features a plaid hat with fur trim, orange nose, and black coal eyes and mouth. 20 in. Green felt. Fun blue velvet stocking with a beaded snowman wearing a top hat, and scarf. 19 in. stocking can be personalized on the cuff.